Zambrero is Mexican with a Mission. Serving delicious, fresh healthy Mexican food that helps tackle world hunger through our Plate 4 Plate initiative. Our menu can be made vegan (VG), vegetarian (V) and gluten-free (GF). Vegan cheese and vegan sour cream is available. For allergen and nutrition info, please see zambrero.com.au/allergens. Menulog delivers for Zambrero - Jamison so you'll be able to track your courier on a map. Includes: your choice of filling, white rice, pinto beans, freshly made salsas, cheese, sour cream, cos lettuce and sauce. Vegan & Vegetarian (excluding cauliflower) include guacamole, and a double serve of pinto beans and rice. Includes: your choice of filling, pinto beans, our signature Salsa IQ®, guacamole, cos lettuce, black rice and sauce. Vegan and Vegetarian (excluding cauliflower) include double servings of guacamole, pinto beans and rice. Includes: black rice tortilla (GF), 50% extra serve of your choice of filling, freshly made salsas, pinto beans, cos lettuce, black rice and sauce. This item is not vegan-friendly due to the tortilla. Vegetarian (excluding cauliflower) include double servings of guacamole, pinto beans and rice. Our Classic Burrito served in a smaller 10-inch tortilla size. Includes: your choice of filling, white rice, pinto beans, freshly made salsas, cheese, sour cream, cos lettuce and sauce. Vegan and Vegetarian (excluding cauliflower) include guacamole and double servings of pinto beans and rice. Our Burrito IQ® served in a smaller 10-inch tortilla size. 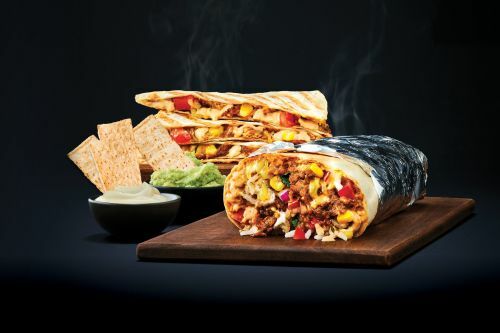 Includes: your choice of filling, pinto beans, our signature Salsa IQ®, guacamole, cos lettuce, black rice and sauce. Vegan and Vegetarian (excluding cauliflower) include double servings of guacamole, pinto beans and rice. Includes: 50% extra serve of your choice of filling, freshly made salsas, pinto beans, cos lettuce, black rice and sauce. Vegan and Vegetarian (excluding cauliflower) include double servings of guacamole, pinto beans and rice. Includes: crispy corn chips with your choice of filling, cheese, guacamole, sour cream, freshly made tomato salsa and sauce. Vegan and Vegetarian (excluding cauliflower) include pinto beans. Includes: a crunchy taco shell with your choice of filling, cheese, sour cream, cos lettuce, freshly made salsas and sauce. Vegan and Vegetarian (excluding cauliflower) include guacamole. Includes: a soft flour tortilla with your choice of filling, cheese, cos lettuce, sour cream, freshly made salsas and sauce. Vegan and Vegetarian (excluding cauliflower) include guacamole. A crunchy taco shell wrapped in a warm soft tortilla. Includes: your choice of filling, cheese, sour cream, cos lettuce, freshly made salsas and sauce. Vegan and Vegetarian (excluding cauliflower) include guacamole. Includes: freshly made tomato salsa, sauce and cheese melted between a toasted 6-inch soft flour tortilla (2 per serve). Includes: your choice of filling, freshly made tomato salsa, sauce and cheese melted between a toasted 6-inch soft flour tortilla (2 per serve). Includes: freshly made tomato salsa, sauce and cheese melted between a toasted 6-inch soft flour tortilla (1 per serve). Includes: your choice of filling, freshly made tomato salsa, sauce and cheese melted between a toasted 6-inch soft flour tortilla (1 per serve). Includes: your choice of filling, white rice, cheese, freshly made salsas, cos lettuce, sauce and a side of corn chips. Vegan and Vegetarian (excluding cauliflower) include pinto beans and guacamole. Includes: your choice of filling, black rice, cheese, our signature Salsa IQ®, guacamole, sauce and a side of corn chips. Vegan and Vegetarian (excluding cauliflower) include pinto beans and a double serving of guacamole. Includes: crispy corn chips topped with your choice of filling, cheese, guacamole, sour cream, freshly made tomato salsa and sauce. Vegan and Vegetarian (excluding cauliflower) include pinto beans. Crispy corn chips dusted with Zam Spice, available with large sides of guacamole and/or your choice of sauce (Gluten-free option available). Crispy corn chips topped with your choice of freshly made salsas, guacamole, sour cream and your choice of sauce. Shine+ are Australia’s first Smart Drinks which combine natural and functional ingredients shown to support mental clarity, concentration and health.